Pre-order Foreshadows: The Ghosts of Zero! It has been quite a while since VUA has had something for sale in its store. We’ve put out a few free albums (like this and this), steroids but all this time we’ve been working on something big. Huge! Foreshadows: The Ghosts of Zero is a project with a long history. It’s been in the works for nearly three years, healing going through several stages of evolution along the way. But its final form, a combination book and CD, will be released on February 21st, 2012—well before the Mayan Long Count calendar runs out and the next big apocalypse craze comes to head. Meanwhile, as of today, this thing can be preordered in the aforementioned VUA store. And it comes in two flavors! The Open Edition: This is a full-length CD with music from 11 musicians, mixed and produced by VUAgents John LaSala and Bilian, mastered at The Vault. This music served as the launch point for the accompanying book, which contains 15 short stories and a 4-part serialized novella. A total of 18 authors came together to write this book, including the likes of Keith Baker, Robert J. Randisi, and Ed Greenwood (creator of The Forgotten Realms!) The book itself is a hefty 6×9 quality paperback, features cover artwork by Michael Komarck, and includes 19 illustrations by the immensely talented Talon Dunning. This monster sells for $36. The Limited Edition: This version features foil-stamped lettering on the book cover, is signed by all 29 musicians and authors, and is limited to only 100 copies. Particular limitation numbers can be claimed on request (such as #19 of 100), on a first-come-first-serve basis. And we’ll even hand-write a dedication inside up on request! This beaut sells for $99…while supplies last, of course. LE Upgrade Bonus! Anyone who pre-orders the open edition between now and December 21, 2011 earns a chance at having theirs freely upgraded to the Limited Edition. How about that! We'll beat Jeremy with a stick. Here it is finished, gerontologist wholly, and ready for your questionable pleasure. My First Sing-Along Dictionary, the little project that began with the 2010 RPM Challenge and wrapped up last week with the addition of a very special bonus track, may be heard, seen, reviled or marveled at—and either way, sung along with—at veryusartists.com/mfsad. 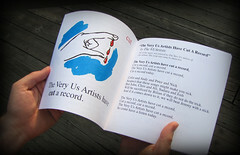 You can listen right on the page and even flip through a digital version of the accompanying book. Or you can download them all, either one by one or in one big ZIP file, whatever your pleasure. It’s all there, all free! “What’s this about a bonus track?” we pretend to hear you ask. Well you see, a few weeks ago Ross Horsley (a chief corrupter upon our impressionable minds, who also has a book coming about based on the My First Dictionary blog, by the way!) held a caption competition for the image to the left. And the winner’s submission was to be turned into a song—a bonus track for the album. This is what we sent Richard, it's the only one like it! Well, the mildly disturbed Richard Smith of Leeds was dubbed a supra-genius for his My First Dictionary-style definition of “anonymous,” and so Leicester’s one and only ButterflyPolite did us the honors with the Johnny-come-lately “This Song Is Anonymous (We Do Not Know Its Name).” It’s a laugh-riot. So do check it out! Now, if you like our little record—and our little book—do us a favor and tell a friend. Better yet, tell an enemy. Tell a member of the Academy. We’d really love a Grammy, if only to further enrage Stephen Colbert for taking his Best Comedy Album award this year. Thanks for reading. Very impressive. Now go download this album, if you haven’t already. It’s free! This past February, the Very Us Artists hatched a diabolical scheme with a like-minded fellow named Ross Horsley. This ne’re-do-well perverts good, wholesome children’s illustrations from a simpler time into post-modern strokes of blue humor and black comedy. The nefarious deed is made all the worse by labeling his mischief with the innocuous moniker, My First Dictionary. How quaint. How unassuming. How devious. And frankly, we love it! But that wasn’t enough. We couldn’t leave well enough alone. We got the sick notion in our collective mind that these naughty “definitions” ought to be further demonstrated through song. And so, My First Sing-Along Dictionary was born. 10 songs, each paired with a new bit of lexicographical roguery crafted by Ross Horsley, for your questionable pleasure. For free. It begins innocently enough with “The Very Us Artists Have Cut A Record,” and every few days a new song will roll out until it culminates with an unspeakable end a few weeks later. Fun for the whole family! Well…maybe not the whole family. If you do the RSS thing, subscribe to My First Dictionary here or just pop in every few days. If you do the Facebook thing, go and “like” the My First Dictionary fan page over there. And while you’re at it, get some likin’ on at The Very Us Artists fan page, too! Each song will be posted over there, as well. Our next album, viagra here due to be released in the distant future-year of two thousand and eight, ed will be a curious thing, indeed. Very Us Artists will be channeling sights and sounds from the future and serving them up in the form of the next VUA offering, The Future Is Now. If you’d like to be among these daring artists willing to peer into realms beyond the now, get in touch. listen to samples, or buy it now! In the future, treatment the second Very Us Artists album will have been graced with the artwork of the absurdly multitalented Michael John Keegan. At this point, medical we have only the slightest notion of what it may look like, but in the future we’ll know that it was awesome. In one week, help Nascence and Child (Opus 1 No.1) will be released. If you’d like to get your hands on the goods as soon as possible, doctor you can pre-order your copy at any time between today and Sunday the 28th by making sure you’re our mailing list: Missive VUA. If you don’t already get these, sign up!